Here is a good article from a conservative...at least in principle...opinion writer sending out a warning signal to fellow conservatives. I think you will see more and more of these as this unfolds. Here's an article for you from WaPo telling the deranged to manage your expectations. So you think that now the GOP is Trump and Trump is the GOP. So you are anchoring your defense of Trump and his Administration is that "the campaign’s documented contacts with Russians may prove to have been naive, bumbling, reckless, sleazy, unpatriotic or some combination thereof — but not criminal"? No, that is from a guy who pushed the Russian collusion conspircy theory, who is now walking back the idea that they Trump campaign was colluding. I've said from the start that there is no evidence of any wrongdoing by the Trump campaign. Cohen's lie was about a potential Trump Tower project in Moscow than never happened. 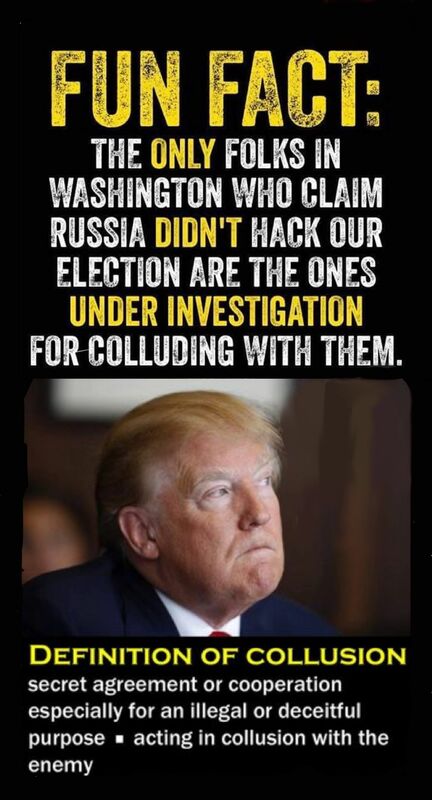 Even if it did, that isn't a crime and has nothing to do with the election. Mueller to date has one old man on a tax case from 10 years ago and some other insignificant players on perjury traps. There is still nothing to prove Russia had any influence on the election. Except all the intelligence agencies said that Russia did interfere. And anyone should put any weight on your opinion...why exactly? But you've been instructed to not see what you're seeing. Suddenly, I am picturing a guy falling from a skyscraper, saying "So far, so good".